If you’re like me, you probably have WAY TOO MANY books, but you don’t want to get ripped off by selling them at Half Price Books. The good news is that it’s really easy to make a lot more money than you would from HPB by selling them on either eBay or Amazon (I prefer to sell my books on Amazon). But when I got started selling my books online I was spending way too much money and time just getting the books packaged and shipped. So I looked for a better way . . . and found it!!! I now have a nearly perfect way to pack and ship books that’s easy to do, cheap, doesn’t take much time and pretty much guarantees that your book won’t be damaged in transit. Follow these simple steps below and you’ll never ship a book another way again. Step 1 – Gather the needed supplies. 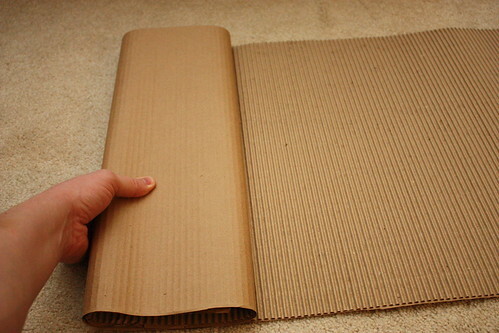 You probably don’t own any corrugated cardboard, but the stuff is awesome for shipping books. It just works. It works so well in fact that I’ve found myself using it for shipping all sorts of stuff (DVDs, Video Games, etc). I bought my roll of b flute from a local paper/cardboard box dealer in 2007 and I haven’t run out of it yet (as of August 2011). It was the best $25 I have ever spent on shipping materials and was BY FAR CHEAPER than using cardboard boxes or manilla envelopes. If you want to save as much money as possible on shipping books you really need to use this method. Step 2 – Put the book and order slip into a plastic poly bag. You need to ensure that your book arrives to its intended recipient in the same condition it left. I like to put the book along with the order slip into a plastic bag to protect it from any moisture damage. The bag also keeps the book from getting scuffed up by the cardboard. 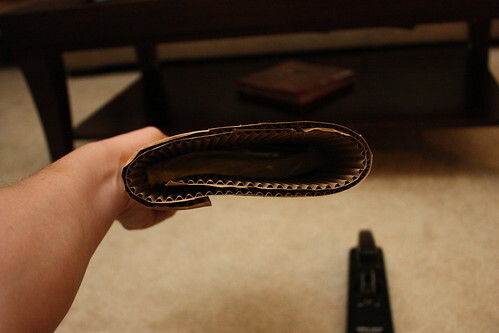 I like to leave a little bit of air in the bag to add some extra cushioning for even more protection. Again, you don’t want your book to be damaged in transit. That’s never good for anyone. 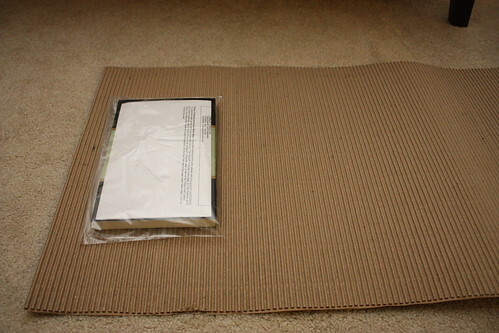 Step 3 – Wrap the book with cardboard. Once the book is snug and secure in its plastic bag, wrap it tight with the corrugated cardboard. You’ll want to make sure you hold it tight through this step because the cardboard tends to unroll fairly easily. Wrap it with two layers of cardboard. Any more and you’ll have trouble stapling it closed. Any less and the book is more likely to get damaged. Step 4 – Staple the ends of the package closed. Now that your book is tightly rolled with the cardboard, grab your heavy duty stapler and close both ends of the package. I’ve found that 1/2″ staples do the job pretty well. Just be sure to pay attention to the limits that your stapler has. I bought some that were too long for my stapler once, but 1/2″ seems to work just fine. 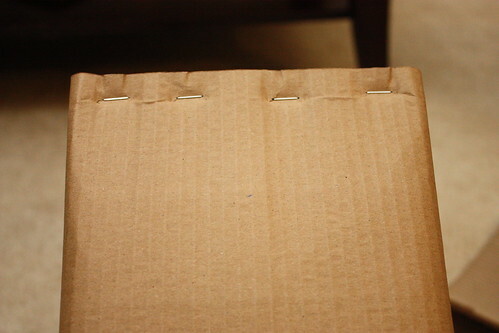 Put use about four staples on each end of the package, depending on the size of the book. The key is to make sure the package stays closed, but you still want it to look professional, so don’t go crazy with the stapler (as tempting as it might be). This step took me the longest to perfect. Just be patient and don’t worry if you make a mistake. Practice makes perfect. 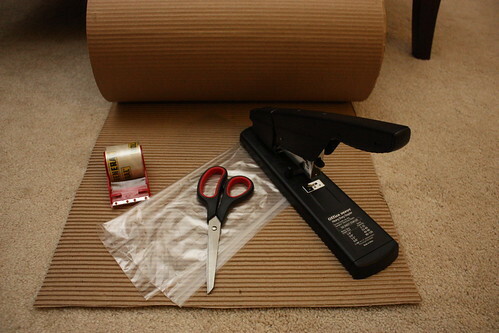 Step 5 – Cover the seam with packing tape. 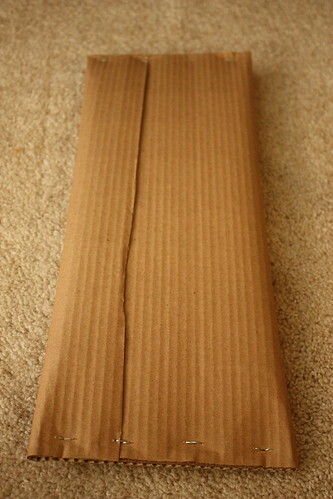 To keep the package a little more secure it’s a good idea to cover the seam on the back with a strip of packing tape. This will help prevent the package from opening during transit and keep things just a little more secure overall. 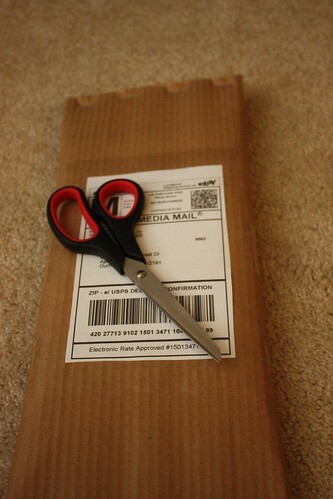 Step 6 – Add a shipping/postage label. The cheapest form of shipping that’s out there for books is USPS Media Mail. This is a discounted rate for shipping books, CDs, DVDs, and video games and the like. The USPS lists shipping time as taking up to 9 days, but I’ve found that the package usually arrives in 4-5 days. It’s a great price for a service that doesn’t take much longer than more expensive options. I always print labels using PayPal, no matter how I sold the book. I also just use regular paper (it’s cheaper) and affix it to the package with packing tape. UPDATE (August 2011): I now use self-adhesive shipping labels and I’ll never go back to plain paper. It’s so much faster than messing with cutting and taping plain paper, so it’s completely worth the little extra expense in my books. Printing the label at home is cheaper than buying it at the post office and you can easily track the status of delivery. PayPal sends an email confirmation with the tracking number for every label you create, so it’s easy to track down the number. Step 7 – Ship it. This step is probably way too obvious to really be necessary, but I did want to point out that you have couple options on how to actually ship your package. I live really close to the post office, so I’ll just drive by and drop the package into the bin inside the building. I’ve never had to wait in a line for this, so it’s really quick to get in and out. You could also schedule the USPS to pickup your package from your home, so that might be an even easier option for you. So that’s the method I use. It takes some practice at first to make the process run smoothly, but after you’ve done it two or three times you’ll find it happening much more quickly. I’ve only made a few tweaks over the years, but I’ve yet to find a better or cheaper way to ship books. Do you sell books online? What tips or tricks have you found useful? Is there anything unclear in my tutorial? I’d love to hear from you. Please share your thoughts in the comments below. Disclosure of Material Connection: Some of the links in the post above are “affiliate links.” This means if you click on the link and purchase the item, I will receive an affiliate commission. Regardless, I only recommend products or services I use personally and believe will add value to my readers. I am disclosing this in accordance with the Federal Trade Commission’s 16 CFR, Part 255: “Guides Concerning the Use of Endorsements and Testimonials in Advertising.” Thanks to Michael Hyatt for this disclosure statement. I don't sell books online but I do swap them via PaperBackSwap.com. My packing technique is similar to yours, though I use brown wrapping/shipping paper and tape instead of the corrugated cardboard and staples. I also prefer to use self-adhesive paper to print my shipping labels. Does PayPal charge a fee for printing out the Media Mail postage? Since USPS doesn't sell the MM postage online I've done it through PBS, but they charge a fee. PayPal does charge a small fee for the postage, but the postage costs less overall. I spent much more on postage one time when I bought it in the post office, so it's worth it, to me, to print from home. I only have one of those community mailboxes in my neighborhood, so I can't stick it in my mailbox. How do they manage to charge less than straight postage value? I thought there were set postal rates. Oh! It also occurred to me you might include a link to the books you have for sale. Good question. I couldn't remember why I went with PayPal for the postage label, but I figured it out. The USPS has Click-n-Ship for buying labels online, but they don't offer Media Mail as an option. PayPal does, which ends up being quite a bit cheaper than Priority Mail. I usually pay less than $3 per book. This is a helpful post, particularly the part about using PayPal. I’d never thought about that. I just started selling some extra books on Amazon, and I was curious whether you exclusively use Media Mail–even to customers in Alaska or APO boxes? I went to the post office today, and the worker told me it would take exponentially longer and I’m nervous about someone claiming they didn’t get it so I mailed it all regular. I had one shipment to Alaska and one to an APO, which meant I ended up losing money. In your experience, has it still been alright to send Media Mail to those places or do you have any rules about shipping outside the contiguous 48 states? Thanks for any details you can provide!! Thanks for the comment! I haven’t had any problems with delays in shipment. Amazon gives some nice buffer time for shipping, so it hasn’t been a problem for me. That said, I have only shipped a couple things to Alaska. I’d say if you’re worried about it getting there on time to upgrade the shipping method even if you end up not making any or just a little money. To me the positive feedback is worth the extra cash spent. Good luck with the shipping! Thank you for your time. This was very helpful to me. Does paypal offer priority shipping labels also? I have an order to be delivered in two days. Do I have to wait in line and pay for priority shipping? Hello! Thanks for the packing tip. It looks like we will give it a try. I just wanted to make a quick note to all who may stumble across this – some other shipping options. Two nice postage services are endicia.com and stamps.com. They provide a huge range of services for doing postage and are cheaper than walking in to the post office. They have monthly fees, but if you have a volume, the amount of work they save is significant. We ended up using endicia because it works nicely with our inventory management system, Fillz.com. A couple of other inventory/sales management websites for booksellers is theartofbooks.com and ka-zam.com. Hey Chad, thanks for the advice on the sites! I’ve used stamps.com before, but never had heard of endicia.com. I don’t deal in a lot of volume, so I’m not sure if it would save me enough to justify it, but maybe someday! The postal agencies hate staples as they tear other package etc. That’s true, but I usually make sure the staples are fully pressed down, so hopefully it doesn’t cause any problems. How do you pack your books for shipment? Maybe I missed the obvious step, but don’t you use tape or something for the seam between the 2 stapled ends, you know, to close the gap? And can you trace your shipment with Media Mail? Glad to see you wrote this so clearly! Is it hard to list books on Amazon? I’ve got a bunch to put somewhere and I figure eBay is just not going to be cost effective, maybe taking 3-4 relists to get the attention (for a rare or 1st ed. type book). Thanks. Thanks for your comment. You’re right about the tape. I’ve updated the post with that step. It’s not necessarily essential, but it does help. 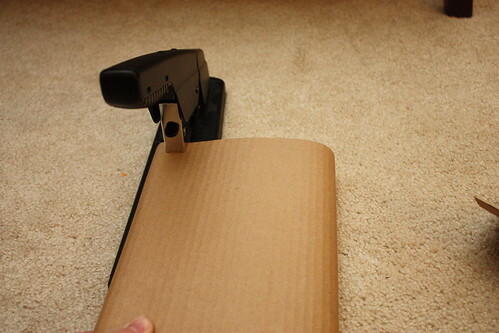 As long as you roll the cardboard fairly tight it will stay secure. You can add delivery confirmation to Media Mail (I do). This isn’t true tracking, but it at least will let you know the other person got it. It’s really easy to sell on Amazon. I’m working on a post to outline how to do that. Hey Kevin, thanks for the tips! I ship a lot of books, and I may try your method, although it is a very large set up fee! I currently get free used boxes from stores, and that works ok, but sometimes it costs me more in postage if the box isn’t small enough. I also just tape my labels, but it is very time consuming!! I put a note in my mailbox for the mailman to pick up my packages, and you could probably do the same and save some time; they are making a lot of money off of us, so they are usually happy to pick them up. Is it cheaper to use paypal than to use the shipping that Amizon provides? Thanks for this. I hand make boxes using corrugated wrap for my Book Beads. It is both protective and beautiful to look at! I cannot find it locally though, so I’m having to order it online (ebay, free s/h). I’m curious if anyone else has done this? Do you have a scale that you weigh the books on? Where did you get it and what was the cost? Great question Lisa. I’ve had my scale for a LONG time. It’s nothing special and I don’t remember what I paid for it. I’ll get a picture of it and post it later. What I usually do for shipping, though, is I see how much the item weighs according to Amazon and add about 4 ounces or so. The Media Mail rate only changes at each pound, so as long as it’s less than the next change of pound there isn’t a rate increase. So how do you know how much it will cost before you send it? And how do you pay the shipping if you just drop it in the bin? I’ve never shipped anything before. Thanks!! Great post and great info. So you have not encountered damaged/mangled books with this method? I sell and ship a book I self-published and I’ve had a couple of comments come back to me about mangled books. Thus, I’m eager to find a new method (I currently use a padded mailer that exactly fits my book, but I guess somehow it gets beat up in the mail). Can you tell me what weight/size of corrugated cardboard you suggest? i see there are many different strengths available. The page is a great help by the way! I love this idea and will implement it for shipping journals to my coaching clients and books to customers! Thank you for the creative ideas! Once you ship a few it’s really easy to use. I’m glad you like it. Great tips and very helpful Kevin. Much thanks.